Chemnitz, then Charlottenburg, Germany. Language: German. Editor: Dr. med. E. Aigner; Wilhelm Weege. Corporate author: Organ d. Deutschen Spiritualistenbundes5/1, 1909-24, 1929. 24-48 pp., Mk 6. 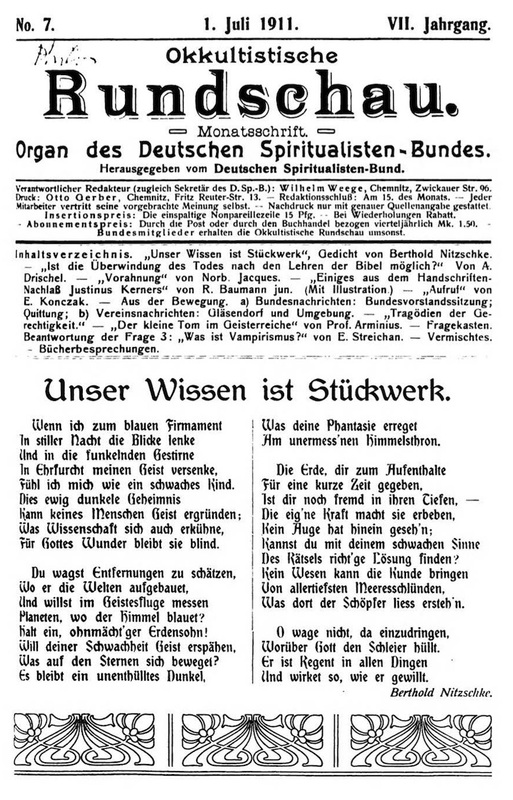 Continues volume numbering of Psyche—>Spiritistische Rundschau. The Deutsche Spiritualisten-Bund was started in Gera in 1901 by the consolidation of regional and local spiritualist societies. The journal featured reports on the activities of its member groups, with articles on the manuscripts of Justinus Kerner, superstition, psychometry, magnetism, painting mediums, healing, handling opponents of spiritualism, etc. Articles by and excerpts from Cesare Lombroso, R. Baumann and a few other well-known spiritualists. Psychische Studien, June 1922, notes the appearance of 1/1 of a journal with this name, commenting on its courage in publishing a journal of that name for scientists. Oberosterr, Landesbibliothek; ZDB: Berlin SBB Haus Potsdamer Str; Leipzig DNB; University of Iowa.